The Canon XC10 is one of a number of cameras that don’t fit the conventional shoulder-mount design. It’s a hybrid that can shoot video, 4K or HD, and stills. The compact body has an integral 10× zoom and includes a viewfinder hood for daylight viewing of the display screen. The first time I held the Canon XC10 it reminded me of a roll film SLR with a waist level finder—like my old Bronica. It’s partly the cube shape, but also the foldup viewing screen, which means that it can be held at waist level. This ability to ‘shoot from the hip’ could be useful for discreet street videography. To the average member of the public it doesn’t scream ‘professional film crew shooting’ however it is held. The XC10 is a hybrid camera, being equally at home as a stills or movie camera, rather than the DSLR that is essentially a stills camera with video capability. I think most users would view it as a video camera first that also shoots stills. The single CMOS sensor has 4224 × 3164 pixels and measures 16mm across the diagonal. The camera shoots video as UHD (3840 × 2160) at 25 or 24/30 fps, and HD at 1080 50P/50i or 60P/60I and 24/30P. In stills mode the image size is 4000 × 3000 pixels (12 megapixels). The camera is sold in two versions, a 50 Hz and 60 Hz with appropriate frame rates (which Canon designates as PAL and NTSC even though these are long-gone analog composite coding formats). The 60Hz version shoots film rate, 23.98 fps, as well as 29.97/59.94. The camera can also shoot 100/120 fps at 720P. The camera has an integral 10 × zoom lens with a focal length from 8.9 to 89 mm (approximately 8° to 70° horizontal angle. This is equivalent to 18 to 200mm focal length with a super 35 sensor. The maximum aperture is a respectable for a compact zoom at f2.8. The camera has rear display for composition and control. 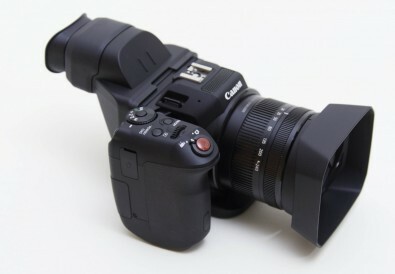 The display hinges for viewing from above or below, but cannot swing left or right into the ‘selfie’ position found on many DSLRs and Canon video cameras like the XF100 and XF200. There is no viewfinder as such, instead the camera is supplied with a clip-on viewing hood, which is ideal for operation in strong sunlight. The camera can be used in a fully automatic mode, controlling exposure and focus. Alternatively, the user can take control, setting shutter speed, aperture and gain (ISO), as well as manual focus. The camera is designed to be held by the handgrip leaving the left hand free to operate the lens rings. The handgrip can be rotated, a feature borrowed from the XF200. Along with the tilting screen, it makes for comfortable shooting low down or held above the head. 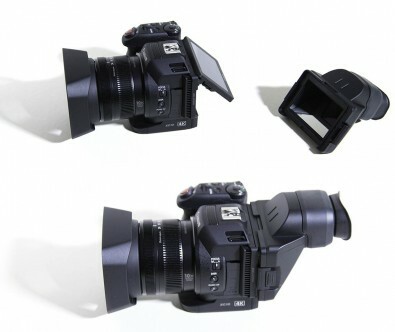 The handgrip has the record button, exposure mode, viewfinder magnify button and menu access. A thumbwheel on the handgrip can be assigned to adjust one of aperture, shutter speed and gain (ISO). The other two parameters can be adjusted from the touchscreen or joystick. The operational and set-up menus can be controlled by touch on the screen or from a joystick on the handgrip. The joystick is essential for use when the viewing hood is attached. Although I favour a knob per function, I did get used to using the touchscreen after a couple of hours using the camera. In normal operation the thumbwheel could be assigned to control aperture and the two lens rings control zoom and focus. The XC10 is one of Canon’s first cameras to use the CFast 2.0 memory cards, which allow much higher data rates than CF or SD cards can reliably record. The XC10 has two memory slots, CFast and SD. CFast is used for UHD recording, and SD for HD and stills. The gain can be configured to display as ISO or gain in dB. The setting ranges from 0dB / 160 ISO to 42dB / 20 000 ISO. If manual control is used an exposure bar provides metering. There is also a zebra overlay. The camera can be used in autofocus (AF) mode or manual. Viewfinder peaking can be used to aid manual focus. AF has the usual facilities like face detection, often decried, but handy for journalists shooting their own interviews. The camera has Wi-Fi remote for control and remote browsing of media cards. Canon has much improved the Wi-Fi set up over earlier cameras so that it is now simple as opposed to convoluted. Wi-Fi allows full remote control of the camera for selfies, operation on a boom or in a remote position, or a drone—assuming the range of Wi-Fi is observed. From a web browser, the user can see a live view, and start/stop recording. Gain, focus, iris and other controls can be set, and the record media status viewed. As the camera can shoot 10-bit log I tried some contre-jour shots to see what I could pull from the shadows with Canon Log. Having Cinema EOS and Canon Log is handy if you are using this as a B-camera to one of the Cinema EOS range. The camera has an internal mic, which can be used for guide tracks, and a 3.5mm stereo jack for an external mic. There is a headphone jack for monitoring. In stills mode the shutter speed adjusts from 1/2 second to 1/2000. An external speedlight can be used with the cold shoe. UHD clips are recorded to a CFast card, compressed AVC in an MXF wrapper at 305 or 205 Mb/s. HD and images are recorded to an SD card. HD date rate is 50 or 35 Mb/s, AVC, variable bit rate, 4:2:2 8-bit. Some computer platforms don’t play with MXF files, but the companion Canon XF Utility can be downloaded from your local Canon website to provide simple capture and ingest of XF-AVC files from the memory cards. Most edit platforms support MXF, including Adobe Premiere Pro, Apple Final Cut (eventually), Avid Media Composer, and Blackmagic Design Resolve, so workflow shouldn’t be an issue. This assumes your editing workstation has the necessary grunt if you are shooting 4K. Batteries are the LP-E6N, 1865 mAh, same as the 5D and 7D, cost around $65.The charger is an optional extra, I would consider this essential but many 5D owners will have a charger already. Without the charger, the battery can be charged in the camera with the power adaptor supplied with the camera. It’s good so see the camera has a cooling fan; many stills cameras are wont to overheat when shooting long duration video clips. Its very quiet in operation. A recent firmware upgrade adds rolling shutter distortion reduction to enable image recording with reduced rolling shutter artefacts when shooting 4K movies. Most functions are controlled from the handgrip, which rotates for comfortable grip at different shooting positions. So who is this camera for? It’s compact, yet can shoot UHD. It’s also very affordable. The small size and Wi-Fi remote lends it to all manner of point-of-view applications where better video quality is needed than the consumer “action” cameras. I can see applications for documentaries, where its discreet appearance doesn’t shout “professional camera”. The camera with battery weighs in at just over a kilo (2.3lb), making it well-suited to lightweight boom shots or attached to a drone for aerials. Location scouts should find the ability to shoot video and stills in full-auto mode very useful whenever something more than a smartphone is needed. Add to that, the optional GPS receiver can tag the absolute location of the recording. I found the camera very easy to use in auto mode, but manual operation requires some finger dances, as there is just the one thumbwheel and the joystick to drive the camera. Thats the price you pay for a small body and a hot price. The XC10 can be purchased for $1999 at discount photo-retailers, for a UHD video camera that’s a snip.